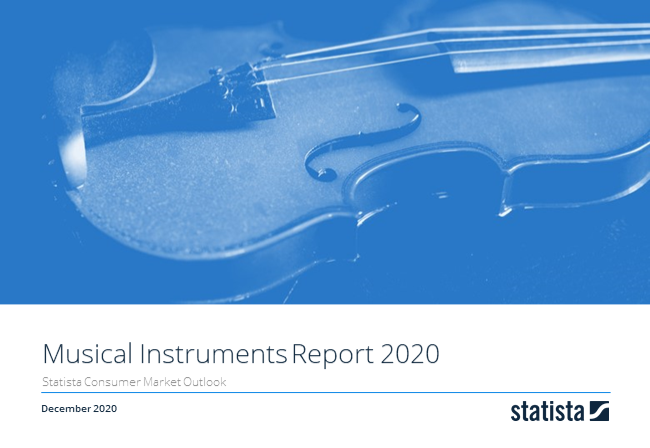 Revenue in the Percussion Instruments segment amounts to US$247m in 2019. The market is expected to grow annually by -2% (CAGR 2019-2023). In global comparison, most revenue is generated in China (US$341m in 2019). In relation to total population figures, per person revenues of US$0.3 are generated in 2019. The Percussion Instruments market includes musical instruments that create sound when struck, scraped or rubbed by hand, with a beater or a similar instrument. While they come in all shapes and sizes, the most well-known percussion instruments are snare and buss drums, timpani, cymbals, triangles, xylophones and tambourines. Reading Support Revenue in the Percussion Instruments segment amounts to US$247m in 2019. Reading Support The Percussion Instruments segment is expected to show a revenue growth of -2% in 2020. Reading Support The average revenue per person in the market for Percussion Instruments amounts to US$0.3 in 2019. Reading Support With a market volume of US$341m in 2019, most revenue is generated in China. Here you can find more studies and statistics about "Percussion Instruments".